As of 2014, we are currently NOT offering wholesale trees. Please remember to check back for updates. We currently have 10,000 Nobles ranging from 4 to 10 feet available for harvest for the 2009 season. Our commercial farm is locatd at 162 Coleman Road, Mossrock, Washington. These are #1 and #2 quality trees. Trees can be cut, baled and loaded onto your trucks. 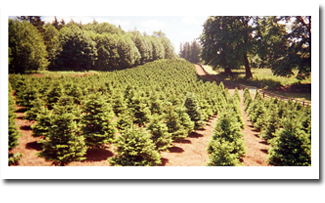 You may pre-select all your wholesale trees, and we will mark and reserve them for you. Prices depend on quantity, so please call for quotes. Copyright ©2017 - 2018. All Rights Reserved.